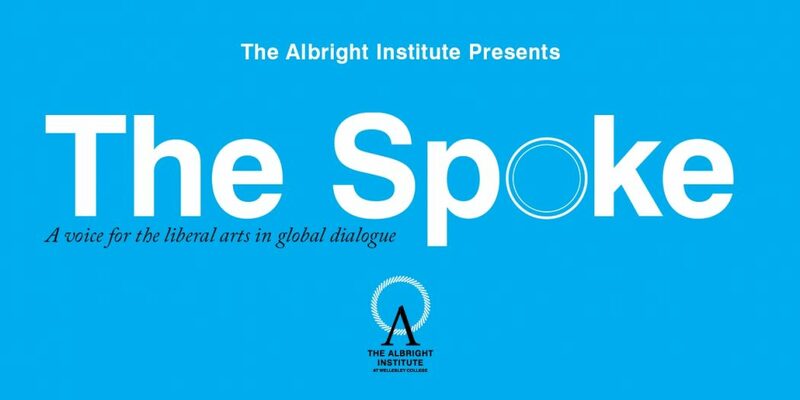 The Spoke, the Albright Institute’s online blog, is a platform where students, faculty, alumnae and interested individuals can publish articles on global and national issues. The idea for the Spoke originated in the winter of 2016, when Assistant Professor of Philosophy Julie Walsh and Assistant Professor of English Cord J. Whitaker sat beside Secretary Madeleine Albright at the annual Albright Institute Winter Session Luncheon. Walsh explained that the luncheon inspired her and Whitaker, whom she had never met before, to reflect on how Wellesley is a place where students and faculty can delve deeper into important global and national issues. “Cord and I stayed back an hour after the lunch and talked about how inspired we were and how amazing Secretary Albright is. We really talked about how Wellesley is a place where we can dig a little bit deeper into some of these really important issues and allow members of our community and members of our extended networks to weigh into some of these difficult questions,” Walsh said. Whitaker said that he and Walsh created the Spoke because they wanted the conversations that took place within the Albright Institute to reach and influence larger audiences. “Professor Walsh and I created [The Spoke] when we noticed that the Institute brings together scholars within and from outside the College from a variety of disciplines, and their work has implications for a great range of matters important in local, national and global affairs. But the good work the scholars were sharing with each other and those who attended the Institute events did not have an avenue for reaching a large audience outside of the academy. We developed the Spoke to be that avenue,” he said. The pilot season of the Spoke began in February 2017 and will conclude at the end of this academic school year. Walsh explained that the primary goal of the pilot season was to work out the logistics of running an online blog, including how often members of its editorial board should meet, how frequently articles should be published and how to best reach readers within and outside of the Wellesley College community. Current members of the Spoke’s editorial board include Walsh and Whitaker, as well as Assistant Professor of History Brenna Greer, Assistant Professor of Computer Science Eni Mustafaraj, Professor of Neuroscience Marc Tetel, Assistant Professor of Neuroscience Sara Wasserman and Associate Professor of Economics Akila Weerapana. The editorial board meets once every other week and its members are responsible for writing and editing articles for the Spoke. With the exception of Walsh and Whitaker, who are permanent members of the Spoke, the current editorial board will be rotated out in favor of new members at the end of the pilot season. Whitaker and Walsh intentionally selected professors from various fields and levels in their academic careers so that the blog would give voice to a multitude of perspectives. “One of the glories of a liberal arts education is breadth: the commitment to the idea that all the disciplines, traditional and newer, come together to help us analyze the world accurately and productively. Having scholars with a broad range of disciplinary and real-world expertise contribute, read, and help the Spoke is absolutely central to its mission,” Whitaker said. Walsh added that the diversity in the Spoke’s editorial board contributes greatly to the quality of conversations that its members have in meetings. “When we [members of the editorial board] meet, it is the most fun I have at work. We have been really lucky in our choice of e-board members because whenever we get together, we have these incredibly interesting and fruitful conversations. I think this is largely because our members come from different academic disciplines,” she said. Mustafara explained that an important goal of the blog is to get students thinking about current events inside and outside of the classroom. “We try to ensure that the articles are speaking to events that are happening in the world. That way when there isn’t sufficient time in the classroom to engage in in these conversations, the Spoke can be a place where students can go to get informed about other viewpoints on what is happening in the world,” she said. Whitaker shared that a few of his favorite articles that have been published by the Spoke include “Dispelling Myths about Free Speech” and “More Speech to Remedy Harmful Speech” by Professor of Philosophy Mary Kate McGowan, “The End of Reading” by Associate Professor of English Sarah Wall-Randell and “How Sexual Assault Built America” by writer Mical Darley-Emerson. “They [the articles] show the range of the Spoke, from constitutional matters such as freedom of speech to the radical changes in our every day communication practices and how they affect us, to how our current #MeToo movement ought to affect our understanding of history and the very foundation of the United States,” Whitaker said. As the Spoke’s pilot season comes to a close, Mustafaraj hopes that the online blog will continue to inspire students to engage in thoughtful conversations outside of the classroom. Whitaker hopes that more students will submit articles to the blog and that the Spoke will have a lasting impact both within and outside of Wellesley. “We hope to see more posts from students at Wellesley and beyond. We hope to see the Spoke have an ever greater impact among policy makers working at all levels of government and society,” he said. Whitaker said that students can help the Spoke accomplish its goals by sharing its articles and sending its editorial board ideas for future articles. “Students can help by reading the Spoke, posting articles they find interesting to their social media and mentioning articles that had an impact on them in class,” he explained. “And, most of all, when they have an idea for the Spoke, email us at thespoke@wellesley.edu,” he said.